One of the two new mini roundabouts replacing traffic lights at Bond End, Knaresborough. The Bond End Air Quality Improvement Scheme works have been completed on time and on budget. The scheme involved the removal of all traffic lights controlling this complex double junction, and replacing them with two mini-roundabouts with associated zebra crossings. Additional works included creating new kerb alignments, providing power supplies for upgraded lighting, signage and Belisha beacons, laying new road surfaces, and improving surface water drainage. Bond End is one of two Air Quality Management Areas in Knaresborough (the other is at the opposite end of the High Street at York Place). Drivers who have contacted me have expressed positive views about the new arrangements. Local residents speak highly of our contractor, PBS Construction, who are said to have worked efficiently and with great consideration for householders near to the construction site. NYCC will be monitoring the performance of the new lay-out over the next several weeks. Work on permanent repairs to the A59 at Kex Gill started on 8 October and is expected to continue into December. The scheme, being carried out under temporary traffic lights, has involved drilling down into the rock below the highway to enable the retaining wall to be firmly fixed in place. The presence of voids in the rock has led to delays in the completion of the project to allow for voids to be filled and the drilling and fixing to be finished. The original timetable proposed a week-long closure of this trans-Pennine route in early December to allow the road to be re-surfaced and drainage to be upgraded. At a public meeting with local residents and businesses on 25 September, NYCC highways officers and I assured the business owners that there would be no road closure close to Christmas. For that reason, on conclusion of the repair works, only patching of the road will take place. Full resurfacing and drainage works will now be carried out next spring. 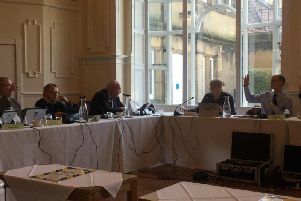 An updated report on options to combat congestion in Harrogate and Knaresborough was brought to the Harrogate and Knaresborough Area Constituency Committee on 8 November. This meeting was held at the Cairn Hotel and attended by a large number of residents mainly from the Bilton area. Ten people addressed the Committee, including Phil Ireland, Harrogate Borough Council’s Cabinet Member for Sustainable Transport, who concluded his address by confirming his support for public consultation on both preferred packages: B and E. Option B includes a wide range of sustainable transport and demand management measures and initiatives to change people’s travel behaviour. Option E consists of those components together with highway operation improvements and investment in the road network in the form of a relief road. The report confirmed the alignment of the relief road which appears to offer the greatest benefit in economic terms is that closest to the edge of Harrogate, farthest away from the Nidd Gorge, and with no link to Bilton Lane. The same paper will now be brought to the Skipton and Ripon Area Constituency Committee next month. The opinions expressed by members of both committees will be included in a report to be considered by the NYCC Executive in January.